I am looking to brew a Munich Helles tomorrow and after taking a look at Graham W's water calculator over at Jim's I could not get it to balance for the lager profile, although I am not sure how appropriate it is given Helles were traditionally brewed in Munich (I understand matching historical water is not necessarily the best approach though). After looking at the price of Asda Smart Price water and seeing it being recommended for brewing it seems a no brainer for me to shell out less than £3 to avoid any issues. Do i need to add anything e.g. calcium chloride flakes to hit a good profile and if so how much (I have this and other water treatment chemicals available)? Oh and am going to ferment this cold with WLP029 but once the wort is made the water treatment part is over so it won't make a difference which yeast i use right? Aleman is probably the best to advise on lagers and water I would think. This thread suggests the alkalinity or smart price water is 42, which is probably too high. No idea about sulphate or chloride levels though. f00b4r wrote: I am looking to brew a Munich Helles tomorrow . . . <snip> . . .Oh and am going to ferment this cold with WLP029 but once the wort is made the water treatment part is over so it won't make a difference which yeast i use right? Kolsch Ale Yeast . . . Munich Helles . . . Nah! Its a pale Kolsch you are brewing, not a Helles . 60-70% of the flavour compounds come from the yeast, the vast majority of the rest of the flavours come from the malt and hops, leaving around 1-2% to be influenced by the water . . . where do you thing you should be applying the most effort or concentration?? f00b4r wrote: I am looking to brew a Munich Helles tomorrow and after taking a look at Graham W's water calculator over at Jim's I could not get it to balance for the lager profile, although I am not sure how appropriate it is given Helles were traditionally brewed in Munich (I understand matching historical water is not necessarily the best approach though). It may not be, but lets consider what is 'appropriate'. Munich water traditionally had moderate sulphate, with a high bicarbonate level. So when they tried to brew pilsener style beer they had a harsh bitterness, as sulphate an high hop rates don't go together well, at least in a lager . . . . The bicarbonate wouldn't have helped either. So by using slaked lime treatment to reduce the alkalinity, and reducing the hopping rate (so BU:GU ratio was around 0.4 to 0.5), they were able to produce a good pilsener style, which I actually like a lot. I don't care too much about the final profile balancing, I just don't think it's important. So what would I aim for for a Helles Water. Chloride 1/3 to 1/2 of the sulphate level. f00b4r wrote: After looking at the price of Asda Smart Price water and seeing it being recommended for brewing it seems a no brainer for me to shell out less than £3 to avoid any issues. Do i need to add anything e.g. calcium chloride flakes to hit a good profile and if so how much (I have this and other water treatment chemicals available)? So, now ask yourself is Smartprice is the way to go, as you may already have those sorts of levels in your water (apart from alkalinity) anyway? . . . Of course if you have to add lots of acid and blow past those levels, you have two options . . . Live with them and see what results , or use Smartprice and play with calcium sulphate and calcium chloride to get your levels around where I suggested. I did a helles with just tap water (using WLP860) and I think it turned out well. No idea what my water profile is mind. I didn't pitch enough yeast despite attempting a 5l starter (using a 5l plastic bottle which used to house supermarket water ironically) so I'd make sure you're happy you're pitching enough. More important than the water profile imo, after all, how much taste can the best water add; 5%? Thanks for the replies, my concerns were mainly around my alkalinity being too high (50 to 76 over a few measurements) and causing harshness, as I only have CRS and sulphate levels that were high to start with. I think I will go with the bottled water as it is only a few quid. 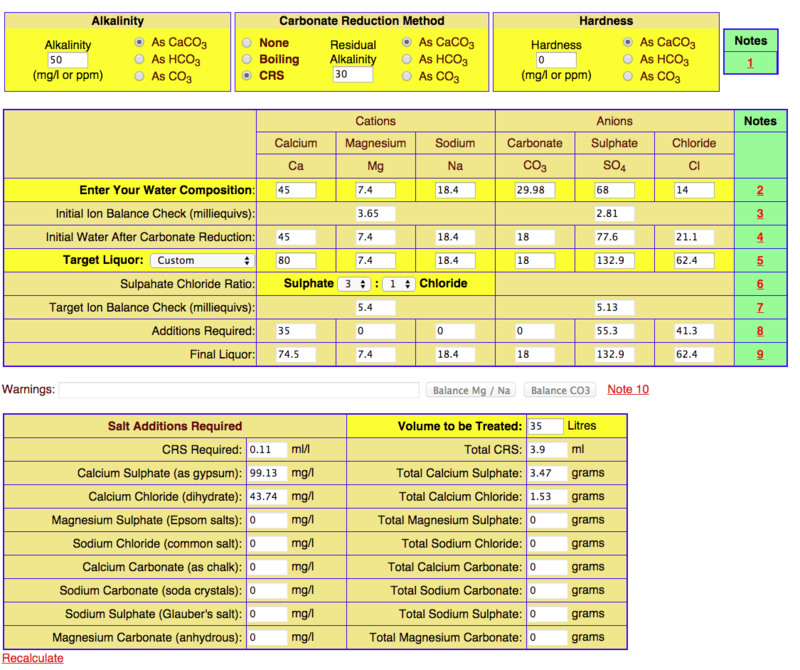 What are you sulphate levels, you shouldn't need to add too much CRS to bring the alkalinity down to 30 from 50-76, so you are not likely to be adding a huge amount of sulphate. As a plus CRS is intended to push the sulphate to chloride ratio towards 2:1 anyway, which is where I suggested you want it to be. My levels are : alkalinity of between 50 and 76, 45ppm calcium, 74 alkalinity, 14 chloride and 68 sulphate.